Delphi4LED – The official website of the Delphi4LED EU H2020 ECSEL project is coming soon. 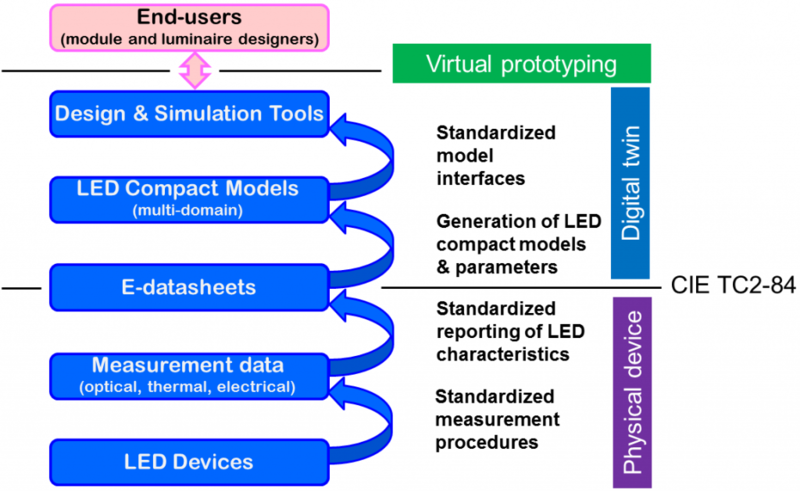 The main objective of Delphi4LED is to develop a standardized method to create multi-domain (thermal-optical-electrical) LED based design and simulation tools for the solid-state lighting industry. Tools and standards will be developed on various levels to enable the design and manufacturing of more reliable and cost effective LED based lighting solutions which can be brought to the market much faster than today. The availability of these standards and tools will also boost the market of integrated smart lighting solutions and by that give Europe the opportunity to outpace the global competition. Linked to the CIE division 2 annual meeting (June 13th to 15th) the NSVV is hosting a workshop to give an outlook on future developments in LED lighting and LED lighting measurement. NSVV has invited scientists from the field of light measurements, building lighting and human perception to share their work, ideas and insights. colorimetry, with a special focus on dedicated activities at CIE Division 2 meetings. by cash or card on the night. WHAT IS STRATEGIES IN LIGHT + LIGHTSPACE LAS VEGAS? 5,000+ attendees. 200+ exhibitors. 60 countries. 1 roof. Strategies in Light, co-located with Lightspace Las Vegas, uniquely provides a collaborative, integrated event experience for professionals representing the entire spectrum of the lighting business. From technology to application to inspiration, Strategies in Light and Lightspace Las Vegas provide an unprecedented environment for learning, observing and engaging with every segment of the industry – all under one roof. SEMI-THERM is an international forum dedicated to the thermal management and characterization of electronic components and systems. It provides knowledge covering all thermal length scales from IC to facility level. The symposium fosters the exchange of knowledge between thermal engineers, professionals and leading experts from industry as well as the exchange of information on the latest academic and industrial advances in electronics thermal management. It is our great pleasure to invite you to join us for the activities at the 29th Quadrennial Session of the International Commission on Illumination (CIE), hosted by the United States National Committee of the CIE. The Session, which will be held from the June 14 – 22, 2019, in Washington DC, is an important event, which will bring together the international membership of the CIE, as well as other experts and stakeholders in the fields of light and lighting – vision and colour, measurement, lighting applications, photobiology and image technology. It offers an opportunity to meet colleagues from around the world, to share knowledge both theoretical and practical, and to contribute to the work of CIE Technical Committees. This Quadrennial Session involves a combination of three distinct aspects of the CIE: A three-day conference for the exchange of technical knowledge and results of new research, through papers, presentations and posters; three days of technical committee meetings, in which experts from each of the CIE Divisions work on the development of CIE International Standards and Technical Reports; and administrative meetings, which mark a turning point, at which the CIE Board of Administration brings on new members, and at which representatives from each CIE member country meet at the General Assembly to set the course of the organization for the next four years. There will also be ample social time to connect with colleagues and friends both old and new. While vitally important for CIE members, this is also a precious opportunity for anyone with an interest in light and lighting, from whatever branch of art or science, from academia or industry, to come together and discuss their interests with like-minded people from around the globe. We hope that you will join us in Washington DC at the Wardman Park Marriott to celebrate the 29th Quadrennial Session of the CIE.
For further information and detailed arrangements, please visit the Conference Website, either directly at washington2019.cie.co.at, through the CIE homepage at www.cie.co.at, or the US national committee website at www.cie-usnc.org.